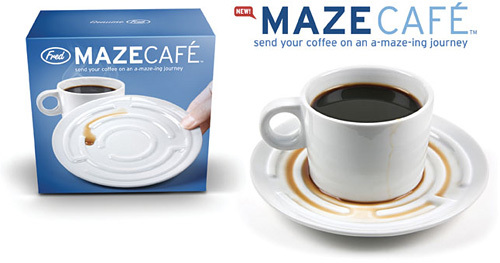 Maze Café Cup And Saucer Set For The Perpetually Distracted | OhGizmo! By Andrew Liszewski on 02/08/11 • Leave a comment! Like I mentioned yesterday, besides serving as easy last minute gifts or nerdy ways to cool your drinks, Fred & Friend’s catalog also has plenty for those who just can’t pay attention to anything longer than a minute or two. So for them this new Maze Café cup and saucer set will provide a few moments of distraction while they’re forced to endure coffee and conversation after a meal. The saucer features a raised maze detail allowing you to guide a drop of coffee or tea from the outer rim to the goal in the middle. It’s not terribly complicated, but let’s face it, anything more intricate and the target consumer would probably lose interest half-way to the goal. Available sometime this Spring, pricing TBA.